Matches between both halves of the Old Firm are usually eventful and this one was no different. Even better, this one occurred fairly recently, so many of you will have strong memories of the occasion. On this day in 1987, the players of Celtic and Rangers ran out at Celtic Park before a crowd of 60,800 for the final league match of the season. The Celtic side was Bonner, Grant, McGrain, Aitken, McGugan, Whyte, McClair, McStay, Johnston, MacLeod, McInally. In the four previous meetings between the teams that season, Rangers had dominated, winning two and drawing one of the three League matches and beating Celtic in the final of the League Cup. 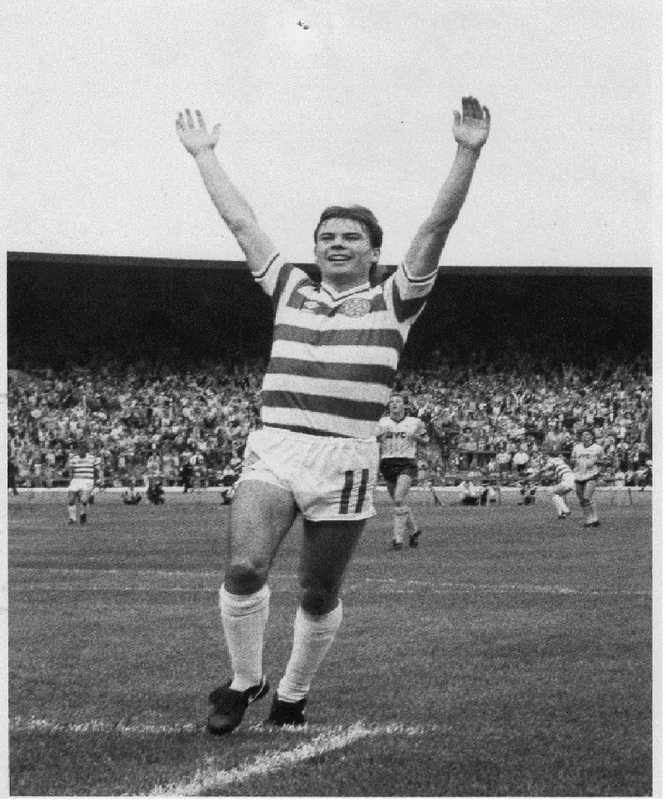 David Hay, the Celtic manager, knew he needed a win, so he set his team up not to lose, playing Roy Aitken in behind Paul McGugan and Derek Whyte at the back, relying on the pace of Mo Johnston and Brain McClair to take any opportunities that came their way. Rangers actually scored first, a Davie Cooper corner swirling its way into the roof of the net with no one touching it but fortunately for Celtic fans, referee Bob Valentine disallowed the goal, pointing to Robert Fleck at the near post before awarding a free-kick to Celtic. In 33 minutes, Stuart Munro fisted a fine shot by Brian McClair over the bar. A penalty was given and McClair made no mistake from the spot to give Celtic the lead. Three minutes later, Terry Butcher up-ended Mo Johnston and another penalty was awarded. This time McClair had to wait a few moments before taking the kick as a fan had run on to the pitch. Once he had been taken away by the police, McClair made no mistake with his effort and Celtic were two-up. Rangers pulled one back eight minutes after the interval, when a low cross by Cooper was flicked in by Ally McCoist but although Rangers piled on the pressure, they could not get that other goal. Then, six minutes from time, substitute Owen Archdeacon scored a third for Celtic and the match finished 3-1. NB. For a number of players in the Celtic side, it would be the last Old Firm match. Danny McGrain was given a free transfer on 12th May 1987; Paul McGugan was transferred to Barnsley for around £55,000 on 15th October 1987; Mo Johnston moved to Nantes on 1st July 1987; Murdo MacLeod to Borussia Dortmund on 16th June 1987; Alan McInally to Aston Villa on 20th July 1987; and Davie Hay was dismissed as Celtic manager on 28th May 1987.